We do exchanges to 9kg, 19kg and 48kg Gas cylinders on site. We often have great specials so remember to come back to our site to see them. Bring in your empty to exchange for a full cylinder. 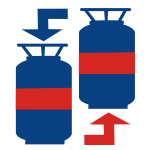 Don’t forget – we also collect - call us for a quote to Pick up and/or deliver your gas bottles right to your home.